OAKLAND, Calif. (AP) — As much as the Oakland Raiders felt like they might have let a couple of winnable games slip away to start this season, they might have stolen one away from the Cleveland Browns to spoil Baker Mayfield’s first career start. 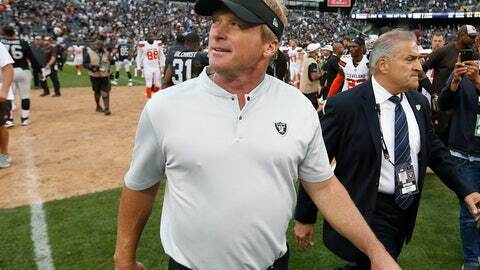 The Raiders (1-3) blew second-half leads in each of the first three games and didn’t trail any of them for a single second in the first three quarters before erasing deficits of 14 points and eight points to beat the Browns (1-2-1) and give Gruden his first win since 2008. The Raiders rode a roller-coaster in this game, falling behind 28-14 in the third quarter before rallying for a 34-28 lead in the fourth, thanks in part to two fumbles by Mayfield. But the Browns answered with two more TDs and the Raiders appeared done when Carr threw two straight incompletions from the 9 to turn the ball over on downs with less than two minutes to play. Carlos Hyde ran three times and appeared to have a first down that would have run out the clock only to have it overturned when officials ruled his elbow touched the ground short of the marker. The Raiders took over at their 47 with 1:28 to go and Carr led a game-tying drive reminiscent of 2016, when he had seven fourth-quarter comebacks. After failing to deliver late in the first three games this season, Carr threw a 7-yard TD to Jared Cook with 30 seconds left and then added the game-tying 2-point conversion to Jordy Nelson. Carr finished with 437 yards passing and four TDs. Mayfield threw for 295 yards and two TDs in his first career start but also had two interceptions and lost two fumbles. Those turnovers helped prevent him from becoming the third Browns QB out of 30 to win his first start with the team since the franchise returned in 1999. As the Raiders struggled to move the ball early in the game, Marshawn Lynch let his teammates know it on the sideline. He then responded with his biggest game in years, running for 130 yards in his most productive game since 2014 and inspiring his teammates by running through several tackles. Browns rookie Nick Chubb scored on runs of 63 and 41 yards, while carrying only three times all day. His 63-yard TD run was the longest by a Browns rookie since Lee Suggs had a 78-yard score on Dec. 28, 2003, and the third-longest run in the NFL this season. Chubb is also the first Browns rookie RB to surpass the 100-yard mark since Terrence West on Sept. 7, 2014. The Raiders were forced to turn to their third kicker this week when Mike Nugent was placed on IR with a hip injury after taking over for the previously injured Eddy Pineiro. They turned to rookie McCrane, who was initially signed this spring by Arizona as an undrafted free agent after setting the Kansas State record for career FGs. McCrane missed his first field goal from 47 yards and then a 50-yarder on the opening possession of OT before connecting on the game-winner.